This summer, we’re offering our clients something special. If you book a bowl food reception for over 100 guests with Create, for a summer party taking place in 2017, we’ll treat you to complimentary dessert canapés – the perfect way to enjoy the summer! When you book a bowl food or canapé reception for over 200 guests, your guests will be able to enjoy a complimentary Champagne upgrade. These offers are based on a three-hour event, with four bowls or ten canapes per person. Both packages include prosecco, house wine, beers and soft drinks. If you’re planning a more informal summer event, a barbecue is a great choice. Our team can provide delicious BBQ menus at our London venues, and when you book a BBQ event this summer we’ll upgrade you from a choice of three hot items to five, completely free. This offer is based on a three-hour summer party package, including a choice of five hot items, three sides and two desserts, prosecco, house wine, beers and soft drinks. 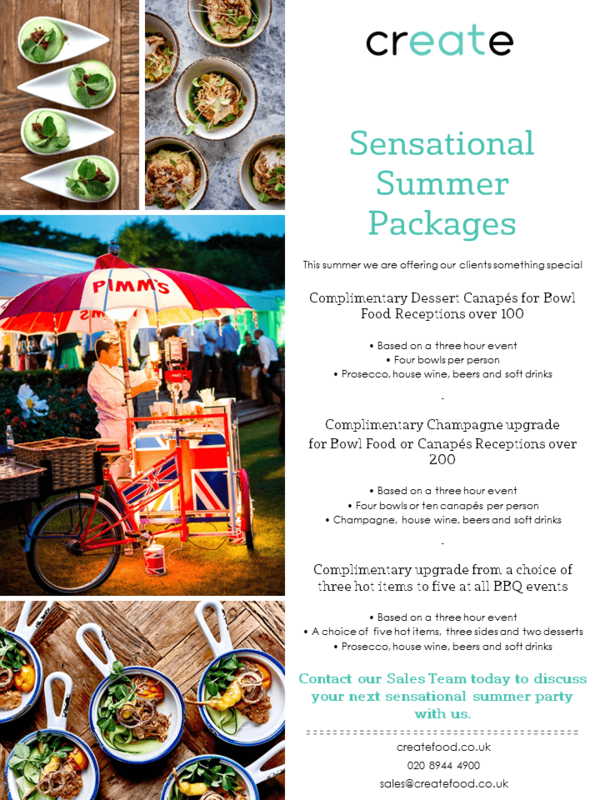 Contact our sales team today to discuss your next sensational summer party with us. Please note this offer applies to new events taking place this summer.